Cyclists in the City: New York spells out you can't keep 'smoothing' motor traffic unless you want to stop people cycling. Meanwhile, Transport planning chief attacks London motor traffic forecasts. So why is the Mayor still clinging to a policy of more roads and more motor vehicles? New York spells out you can't keep 'smoothing' motor traffic unless you want to stop people cycling. Meanwhile, Transport planning chief attacks London motor traffic forecasts. So why is the Mayor still clinging to a policy of more roads and more motor vehicles? 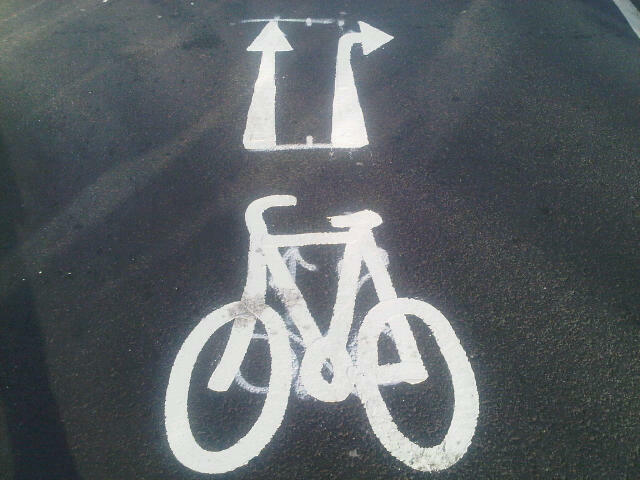 Which way to turn for cycling? When I started this blog, I tried very hard to make it non party-political. What I've realised since then is that writing about cycling need not be party-political but it is a hugely political isue. Some of that politics is now going mainstream. The Times newspaper and Sustrans announced today that they will be hosting a live debate of the four main Mayoral candidates for ninety minutes where they will talk only about cycling. Gosh. 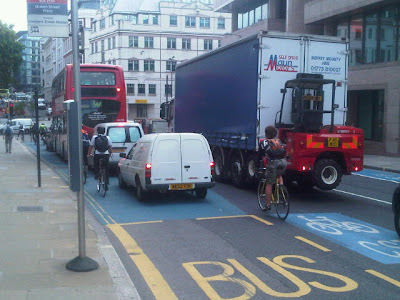 Cycling cropped up as an issue yesterday on LBC radio when Ken Livingstone suggested that Boris Johnson's focus on 'traffic flow' was deliberately putting the lives of people on bikes at risk. Livingstone made the claim slightly clumsily but I think he has a point. Under the current Mayor, it seems that there simply isn't room for a London in which motor traffic isn't going to grow and grow. The rest of us will just have to move out the way so that those extra motor vehicles get 'smoother' conditions. Last month, the Department for Transport issued a report suggesting that London will need to plan for 43% motor traffic growth by 2035. This might seem like just another statistic but it's very important because, as the Transport Planning Society points out: "these forecasts are used to underpin decisions on what transport infrastructure we build". And lo and behold, how did the Mayor respond? He announced a plan to invest in more roads to smooth yet more traffic flow, which you can see here. Compare London's response with New York. In New York, Transportation Commissioner Janette Sadik-Khan says that 'traffic flow' must be about: "reducing private auto use in the most crowded parts of town ... to make more room for [cycling and for buses]". None of that in London. Not from either of the two main candidates, in fact. I cannot say loudly enough how wrong I think Boris Johnson's 'smoothing the traffic flow' agenda is for Londoners. The reality of this doctrine is massive junctions to speed as many cars through as possible; it means high streets turned into race tracks and it means pedestrian crossings removed all over London. Soon it will mean road building, more neighbourhoods plagued with lorries, noise and pollution. Above all, though, it means that proper, safe and sensible cycling infrastructure will always come second to motor traffic. And that means cycling will never be considered a normal mode of transport. The cycling charity Sustrans warned this week that Boris Johnson's road building plans "put the car right back at the heart of transport policy, yet nearly half of Londoners don't have access to a car. Expanding roads, ruling out congestion charge expansion and putting up fares will only see more traffic on our roads...It seems that Boris is intent on bringing the capital to a standstill." in action. Spot the bike lane? And yet, the Mayor seems quite genuine about his plans to improve junctions for cycling. There was the hint last week at reviewing Blackfriars Bridge and there are signs that the Junction Review announced by Transport for London in February has real money behind it. I have to acknowledge that Boris Johnson has ultimately put some money behind cycling and started (albeit rather late) to realise he needs to 'do' cycling properly. Ken Livingstone is also promising safer junctions and safer cycle super highways. In my view, though, the only two politicians who have consistently 'got' cycling and really made noises about it (dare I say before it became a bit more 'fashionable) are Jenny Jones (Green Mayoral candidate) and Caroline Pidgeon (LibDem) who was the first Assembly member to stand up and say clearly that the Mayor "favours smoothing the traffic flow for motorists and worsening conditions for pedestrians and cyclists." My sense is that whichever politician becomes Mayor, safer cycling is now more firmly on the agenda than it was at the last election. That's good. But neither of the two main candidates is really addressing the key issue as clearly as New York's transportation commissioner. The message in New York is that you can't keep planning for more and 'smoother' motor traffic growth unless you want to prevent people cycling or switching to other modes. What's more, Boris is selling us a fallacy. Even the head of the Transport Planning Society says that planning for increased motor traffic in London is "no longer realistic" Both the lead candidates should head that message but Boris needs to hear it more loudly. Boris is finally stepping out for cycling in a meaningful manner and his commitment to finding the money to sort out some of London's worst junctions is good. But his obsession with more and more motor traffic and 'smoothing the flow' risks killing off cycling as a legitimate mode of transport. He needs to decide whether he's going to take cycling seriously or simply clog up London with more motor vehicles. Personally, I have travelled some distance politically – in my first ever general election, in February 1974, I voted for Monty Woodhouse (Cons, Oxford West) but by the second election that year I had changed to Evan Luard (Lab, ditto) and then for a while moved further left. I flirted with the Social democrats in the early 80s (anyone remember the “gang of four” now?). I survived, grieving, the Thatcher years, but “New” Labour drove me to an undying cynicism about party politics and I have barely voted in any election since. I just do single-issue politics now. The evidence suggests that I am not alone. Voter turnout in elections has been steadily declining, and the result of the last election can hardly be regarded as conclusive, can it? The Lib-Dems have been proven to have feet of clay – for whatever reason, my own cynical suspicion being that they have got a taste for power now – and our coalition partners have been rapidly dumping all sorts of promises and declarations they made before the election – “the greenest government ever”, no third runway at Heathrow, no more “hugging hoodies”, no more “we’re in this together”. Cameron is now exposed as a landed-gentry old-Etonian toff trying to look like a man of the people by riding a bike, because his policy guru Steve Hilton thought it was a good PR wheeze, not because he actually gives a rat’s arse about cycling. It is obvious that our next Mayor will be either Boris or Ken, and I don’t much care which – both are as bad as each other as far as I am concerned. Ken had better policies on public transport (apart from bendy buses) and the congestion charge, but he wasted time, goodwill and political capital flirting with odious bigots and terrorists while Mayor. His transport policy now specifically rules out reinstating the Western CC extension, or increasing charges in the eastern section, and it panders to the ever more greedy demands of the private motorist’s self-appointed lobby. (I have no problem with cars – in their place – and am as often a motorist as a cyclist, but I don’t feel I need unqualified driving rights, nor do I believe most other motorists do either). What that leaves is single-issue politics, and you are right – cycle provision is a political issue but not a party-political one. Whoever is Mayor, cycling will only thrive if he (or she) is constantly held to account, if people who cycle, or who would like to cycle, in London maintain their new-found passion for change, and keep up the pressure, on council officials and on politicians of all stripes, through both individual and collective direct action. Attend a flashride. Take part in the Big Bike Ride. Write to your MP, or your local councillor or GLA member, until he is heartily sick of hearing from you and agrees to your requests if only to make you go away. Some one needs to ask Boris where all these extra cars will go? Not only will his demand driven policy mean more spend on roads, it also means more car parks. Where are these supposed to go? Or is the plan for cars to simply never stop going round? And how does this square with the report I read recently that Canary Warf is converting car parking to shops as demand is down from 12% to just 6% of workers based there. If the bankers of Canary Warf are not taking the car to town, who is? Boris has failed London. He should have realised that having got us into this hole, the way to get us out does not lie in merely to continue digging ever harder and faster. Does the solution to a city that is already chock-full of cars really lie in more and more cars? Or might fewer cars hold the answer? New thinking is required and what to do isn't a secret, but Boris and Ken clearly haven't got the answer. I look forward to seeing Boris and Ken out of office and back on HIGNFY, where comedians belong. Boris cycles. Ken worships the bus. Whatever Boris' fault we're more likely to get traction with Boris. Ken's only jumping on a bandwagon. And Maggie Thatcher was a woman. It is a fallacy to think that membership of a particular group implies promoting the interests of that group. Thatcher did absolutely nothing for gender equality. Boris may ride a bike, and it is probably fair to say that he is not a typical "vehicular" cyclist (he rides in a suit, not lycra, and accounts suggest he rides rather slowly, as one must if one rides in a suit) but his "wits about you" remark indicates how very far he is away from being genuinely pro-cyclist. It is true that Ken is not explicitly pro-cyclist, and my fevered imagination simply can't see him riding a bike, but policies which are not hell-bent on maxmising motor vehicle flows at the expense of pedestrians and cyclists through changes to pedestrian light timings*, removal of pedestrian crossing altogether, are more cycle friendly than anything Boris has come up with. Remember, Ken INCREASED pedestrian phases at lights around central London, notably around Trafalgar square? What utter rubbish. Boris hijacked Ken's cycle hire scheme and turned it into a Barclays-sponsored monstrosity. And please ask Boris what milage he calims as mayor for using his bike (clue: He doesn't use his bike - and his taxi use is several times Ken's). Boris has also wiped out all Ken's increasing of pedestrian phases at lights - something I think of every time I set out to cross the main road where I live (as pedestrian lights stay resolutely at red - even when there are no vehicles at all on the road). Some people habitually get things backwards, as you have. You are completely wrong. Would be good to see an update to this article in the light of yesterday's transport hustings.